Hurst Boiler and Welding Company, Inc.
Reduce Carbon, Reduce Emissions, Reduce Operating and Fuel Costs, and SELL your Carbon Credits. Energy solutions based on biomass and bio-fuels provide clean and renewable energy for large national and international companies. Green-thinking companies are now using biofuels to mitigate the impact their activities have on the environment by reducing emissions of greenhouse gases. This can also generate earnings for your company by saving money on energy costs, and by the sale of carbon credits. Achieve energy independence, get off the Gas Grid, and no longer be at the mercy of the oil markets. Hurst Boiler is a leader in the development of boiler technology and energy management projects through sustainable solutions for renewable energy and energy efficiency by biomass. HURST Biomass, Gasification and Gasifier Boiler Systems will strengthen your bottom line by reducing, or even eliminating your energy and disposal costs altogether, through the combustion of renewable fuel sources, also known as Biomass. Consider trading fossil fuels for agricultural biomass, wood, bark, agave fiber, rice husk, chicken manure, sugar cane bagasse, king grass, MSW, construction debris, nuts, shells, husks, paper, card/board products, hog fuel, sawdust, shavings, and/or sludge. Alternative Fuel Solutions and Hurst packaged projects can help you reduce carbon, reduce emissions, and reduce both operating and fuel costs, as well as being eligible to sell your carbon credits. Hurst Boiler provides its clients with the support and expertise necessary to design, fabricate and install complete solid fuel boiler systems, from the fuel storage system thru exhaust gas emission mitigation. Various Boiler designs are suitable for applications to produce high pressure steam or hot water in ranges from 3,450 - 60,000 lbs/hr (3.4 mmBTU - 60 mmBTU) output from 100 up to 900 PSI. As the overall market sets on the path of environmental sustainability and energy costs continue to increase, industry leaders will be hard pressed to find economically viable solutions to stay ahead of the curve. Profiting from the implementation of energy efficient and sustainable technology will be necessary to maintain a competitive advantage. Hurst Biomass Boiler Systems provide successful strategies and technology which can reduce the operational costs of current facilities and provide an ROI from installation in new construction. Let Hurst Boiler help you implement the next generation of technologies in todays facilities. Discover how to obtain immediate benefits from current environmental initiatives. Take advantage of environmental and energy reducing strategies in new construction and retrofit projects. These are just some of the latest developments in Biomass Boiler Technology that Hurst can provide to benefit your business and your bottom line! Learn more about HURST Biomass Boiler Systems and see models and plan views, click here. Generally speaking, the combustion of biomass material produces emissions that can prove to be undesirable. Maintenance is typically also an issue with regular tube-cleaning and ash removal. HURST has virtually eliminated those potential undesirables through engineering, and a proven system. Hurst Boiler & Welding Co., Inc manufactures its biomass boiler systems with an extended burn chamber, increasing dwell time for the combustion of any unwanted particulates and emissions before they are able to exit the system, making the process much cleaner, which reduces maintenance time and costs. Through the effective use of combustion air, a HURST system is capable of burning material with 0-50% moisture content. In fact, the Primary Combustion Zone reaches temperatures as high as 1850°F. 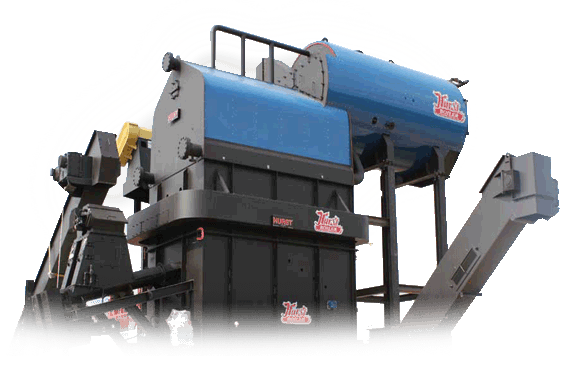 This system removes the ash from the unit automatically into self-contained ash bins, allowing for continual operation; thus, eliminating costly downtime and unnecessary labor and operational costs. In addition, its hands-free operation, makes the system much safer. HURST Biomass Boiler Systems are equipped with high temperature cast refractory ceramic lining for longer life. This cast refractory/ceramic lining was designed to be completely modular, which makes for easy repair and replacement. The HURST PLC Control System is one of the most advanced systems available for biomass combustion in todays market. The Control Panel is fully automated and continually monitored via a Programmable Logic Controller. The air flows and fuel feed rates are constantly and automatically adjusted by way of variable frequency drives to ensure a hot water or warm air temperature that is maintained within 3 to 5 degrees of the desired set point. Fuel feed motors, combustion fans, and the induced draft fan all run on variable frequency drives to ensure the proper mix of combustion air to fuel. The unit adjusts itself automatically according to load demand. The system can also operate on "Maximum Fuel Consumption" Mode to utilize the capabilities of the specific burner and combust as much fuel as possible. All controls and monitoring of the system are accessed via 10-inch color touchscreen monitor located on the front of the main control panel. View and download select CAD files, 3D drawings and Revit models of Biomass Boiler Systems Models. Hurst Boiler & Welding Co, Inc.
©2019 Hurst Boiler & Welding Co, Inc. All Rights Reserved.